At the dawn of the 1950’s, the Theodore Hamm’s Brewing Company, founded in 1865, was quickly becoming a household name. To properly promote the thriving brand, company president William Figge hired the Campell Mithun Advertising Agency based in Minneapolis, Minnesota to create an advertising campaign like non-other. During one of their lunch meetings, a sketch was drawn on a napkin of a bear. Campell Mithun account manager Cleo Hoval loved the idea of a bear being the brand’s spokesperson and the concept was accepted. Several variations of a bear were developed by the in-house artists, but it was the version drawn by Hoval’s friend, Ray Toffelson, that was finally chosen to be the official character design. 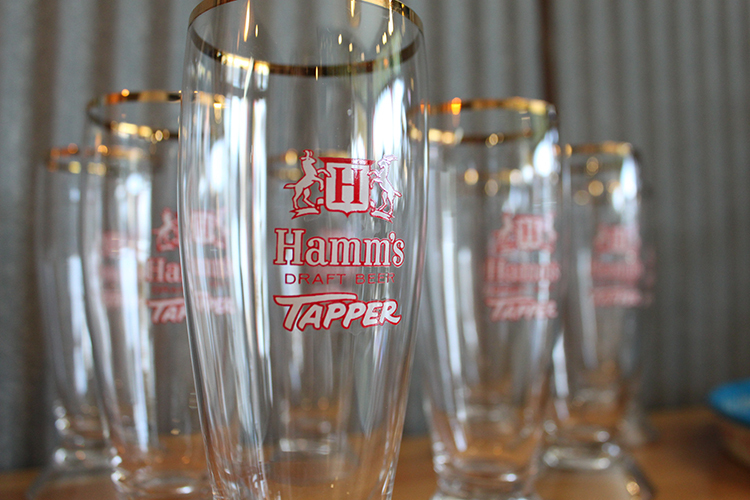 The Hamm’s beer brand continued to thrive and create new advertising opportunities. Hamm’s along with the Hamm’s Bear was one of the first companies to create official sponsorship advertising for college and professional sports. With breweries in California, Texas, Maryland, and Minnesota, the Hamm’s Bear rooted for teams like the Vikings, the Twins and Chicago White Socks, the San Francisco 49ers, and Dallas Cowboys. The campaigns had proved to be so successful that in 1964 Hamm’s claimed to be the largest sponsor of college and professional sports. So, it seems that we can thank pioneers like the Hamm’s Bear for all of the Super Bowl commercials. 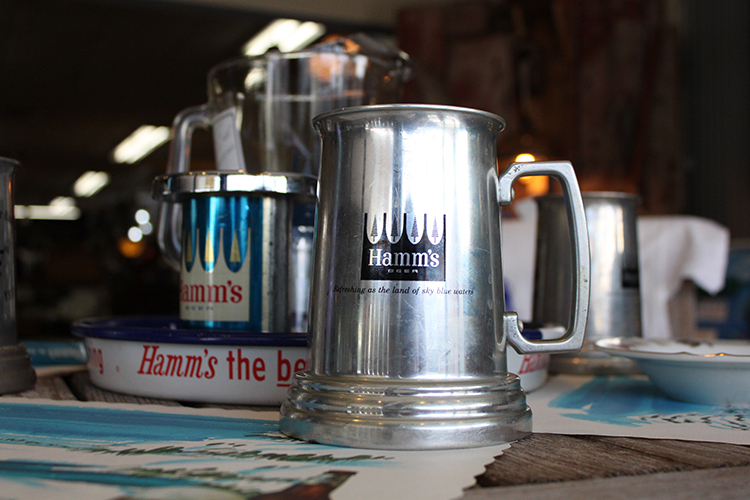 But for now, come in and check out some of the “new” vintage Hamm’s memorabilia at Past and Present Home Gallery. Our selection includes glassware, signs, and various new-old stock pieces. Not that into Hamm’s? Check out the Man Cave for other brand memorabilia and advertising items. Can’t wait to see you at Past and Present Home Gallery, the antique store with character!